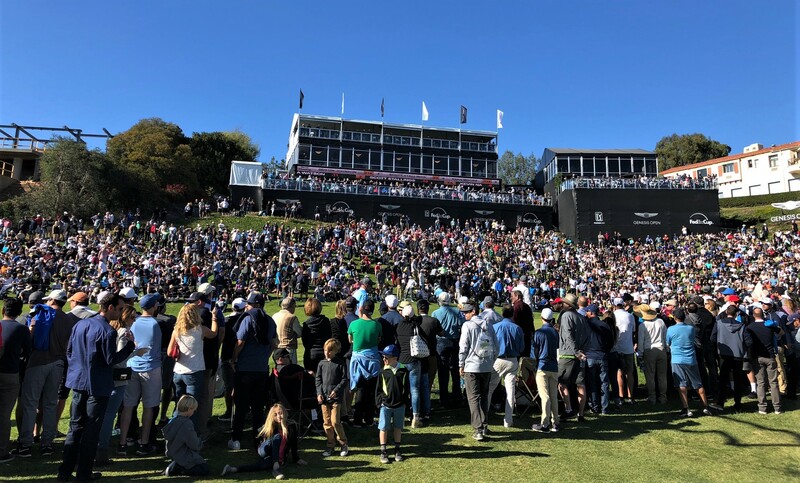 Crowds watched golfers on the 18th hole during the 2018 Genesis Open. The PGA TOUR’s Genesis Open starts tomorrow, Monday, February 11, at the Riviera Country Club with the 2019 collegiate showcase. Tour organizers would like to remind spectators that everyone must enter the golf course through the Longworth Drive gate. There is NO public/spectator entrance to the Genesis Open at the Capri Drive main gate to the Riviera Country Club. There is NO public/spectator parking on Sunset Boulevard or any of the surrounding neighborhood streets. To view transportation options, visit: genesisopen.com and click on Guest Information. People coming to the tournament from Pacific Palisades can ride the Metro bus or use Uber or other rideshares, which drop at Paul Revere Middle School. The Genesis Open’s Good-Any-One-Day ticket offer for tournament rounds (Thursday, February 14 through Sunday, February 17) provides spectators with flexibility on clubhouse and grounds ticket purchases. Those tickets can be purchased online, visit: genesisopen.com/tickets. The Genesis Open is closed to the public on Tuesday, February 12.